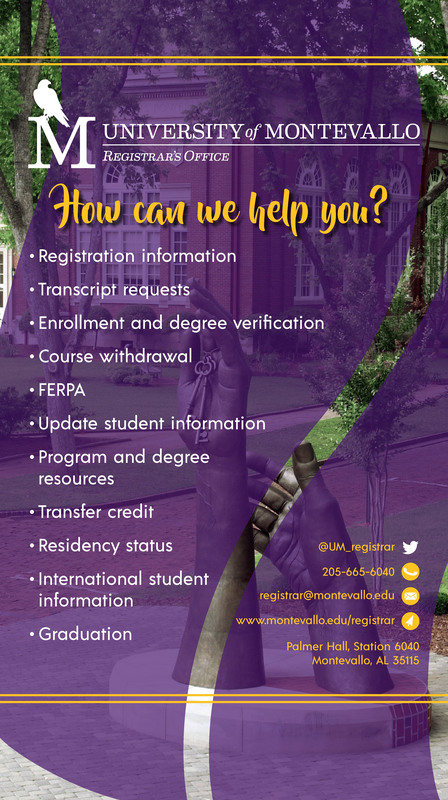 Students intending to withdraw from the University prior to the term withdrawal deadline must submit to the Registrar’s Office a withdrawal form signed by Student Aid Office and the Senior Director of Falcon Success Center. Students receiving financial aid should consult the Office of Student Aid to determine the effect the withdrawal may have on their financial aid. Students residing on campus should notify the Office of Housing and Residence Life of their intent to withdraw and must check out of the residence hall within 24 hours of withdrawal. Completion of these procedures results in official withdrawal from the term at the University, and a grade of “W” is recorded for each course. Courses will not appear on the student’s transcript if the withdrawal is completed prior to the conclusion of the add/drop period. Students may not withdraw from the University after the term withdrawal deadline, which is published in the University Calendar in the University Bulletin, unless they are approved for a Withdrawal for Extenuating Circumstances (see below for more information). Students who do not adhere to the withdrawal procedures will receive the appropriate grade(s) posted by faculty to the academic record at the conclusion of the term. In the case of prolonged illness, debilitating accident, family emergency, or comparably serious personal situations that occur after the withdrawal deadline and that are beyond a student’s control, the student may request a withdrawal for extenuating circumstances. A student seeking a withdrawal for extenuating circumstances must withdraw from all courses for that term; a partial withdrawal for extenuating circumstances will typically not be approved. If a withdrawal for extenuating circumstances is granted, the student will receive a “W” for any course in which he/she is enrolled with a special notation on the transcript denoting extenuating circumstances. Documentation of the student’s situation must be submitted with the withdrawal for extenuating circumstances form as soon as possible but no later than 30 days following the end of the term for which the student is seeking to be withdrawn. The University of Montevallo is committed to supporting service men and women of the United States and the State of Alabama. Military students may apply for a Late Start or a Military Leave of Absence (MLOA) from the University if they are called to duty and must withdraw from the semester, leave prior to the end of the term, attend training during the semester, or miss the beginning of the semester due to military orders. Details are available from the Coordinator of Veterans Affairs. Students may drop and/or add courses through forUM during the specified period, as indicated in the University Calendar. A student who is considering either dropping or adding a course should discuss the proposed change with the academic adviser. Please keep in mind that, depending on the date, a grade of “W” may be assigned and fees may be included.